In this digital era, online identity is crucial that no one can refuse. Creating a blog for yourself can help you to reach millions of people worldwide. I'll ask you a few questions now. Is your offline business going dull? If you need more customers for your business to run successfully, you need a blog set up. It will surely help you to list your products online to make good sales. If your offline store is already going fine, expand your business online to reach potential global customers. If you're a job seeker, why not building a blog to show your Resume to the right employer? If you're unemployed or would like to start a blog to earn money online while having a job, you should know how to start a successful blog. If you're a mom who wants to support your family, blogging is the right way to earn an additional source of income. Since blogging is the work from home business, you can take care of your kids at the same time. Are you looking to find a way to express your views about anything? Then you're at the right place to start your own blog. For any of the above questions, if your answer would be a big YES, you should follow my complete guide here. Do not believe that you can make money from the next day of starting a blog. Blogging is the way to work online for free for a long time to reap your abundant rewards. Remember that there is nothing like Financial Freedom. The only thing which exists is Financial Confidence. 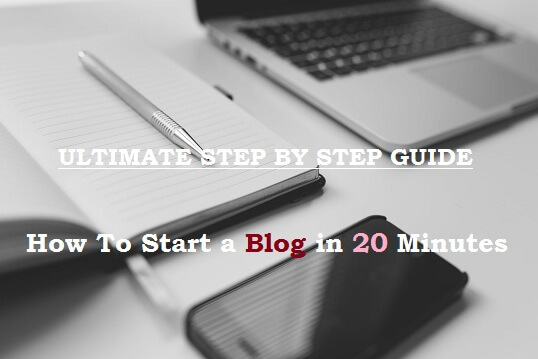 In this tutorial, you'll learn the ultimate guide on how to start a blog in 20 minutes. Blogger platform is owned by Google. Every newbie blogger can start a blog for a hobby with the Blogger platform. It is simple to create a blog using your Gmail id and it's really fantastic. WordPress has a free blogging platform at WordPress.com. Forget about the free blogging place where the opportunities to earn money is limited. But, if you're serious about blogging to make money or to develop your business, you should choose self-hosted WordPress. A self-hosted blog is the best because you'll have full control over it. In addition to this, you'll love the professional look of your blog with WordPress. WordPress.org has unlimited tools and plugins to optimize your blog for SEO. It is flexible and it does require a one-click installation of plugins. The most important part of WordPress is that it has the customer service where Blogger lacks in this part. You can monetize both Blogger and WordPress.org using ads and affiliate marketing. You can customize your monetization methods on WordPress using specific plugins. FYI: When you search something on Google, most of the top 10 sites on the search results are WordPress blogs. A right domain name is better than a good domain name. For example:- I'm on the Tech niche. So, I selected the domain name as Techrolet.com. If you're on a health niche, kids niche or whatever, choose the domain name that tells about your niche. It doesn't need to be an exact match domain name. First of all, go to Godaddy.com and search for the domain name. Godaddy is the world's largest domain provider. It is very popular with a high customer base. For any issues, you can easily contact their customer service team via chat and phone call. Try to get a single keyword name. Your domain name can have 2 to 3 keywords. Make sure that it doesn't exceed 12 letters. It would be hard to remember for your visitors in the beginning. Don't use hyphen or numbers in your domain name. Avoid an irrelevant name for your domain. Choose .com, .net or .org if you target global audience. If you want to target specific countries only, go with domains like .us, .au, .co.uk. Web hosting is the foundation of any website. It is the space provided by web hosting providers to store your blog's images, videos, information, and other content. In the offline world, you need land to start your own shop. In offline also you need a location to save your website files. When you buy a web hosting plan, the service provider will allocate a definite amount of storage space on their servers. Unlimited space and transfer bandwidth. Automated back up of your files and data. 24/7 Live & fast customer support. Add multiple domains to run different blogs. cPanel to conveniently access and control all services in one place. Luckily, Bluehost meets all the above-mentioned criteria. Bluehost is very popular for web hosting services. They are the leading web hosting provider since 2003. If you're looking for the fastest web hosting, you should go with Bluehost. Even WordPress.org platform itself officially recommends the users to choose Bluehost. Now, I'll guide you in setting up a web host. Click here to reach the official website of Bluehost. [This link will activate a special intro offer for you]. 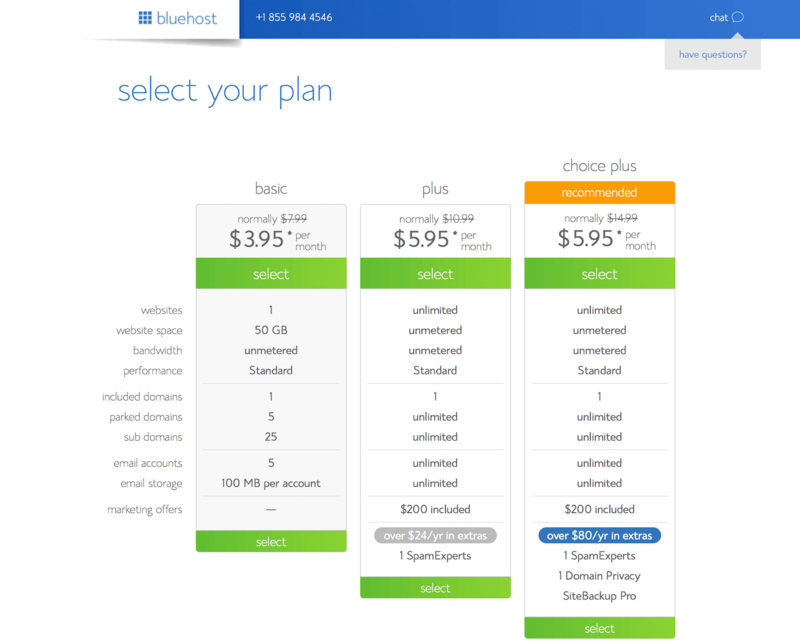 On the next page, you'll see the Bluehost plans and pricing. If you need hosting for one blog, select the basic plan. If you need to host multiple blogs/websites, choose other plans like Plus, Choice Plus or Go Pro. After selecting the plan, it's the time to connect your existing domain if you've bought one from Godaddy. 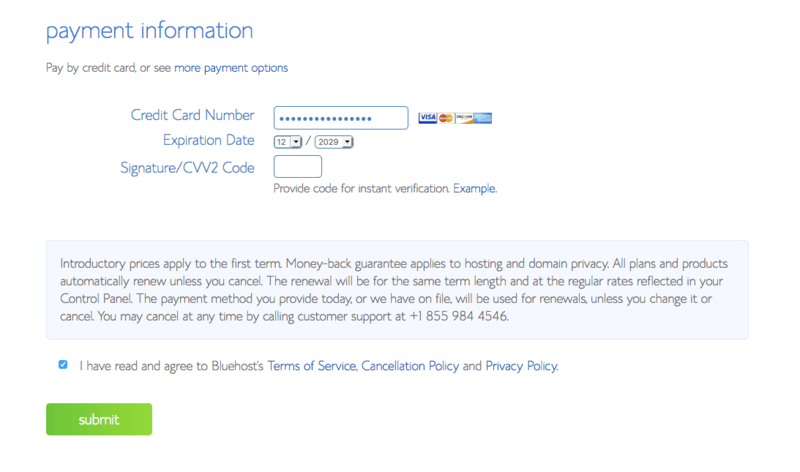 You can also purchase a new domain from Bluehost itself. Provide your account information on the next page. 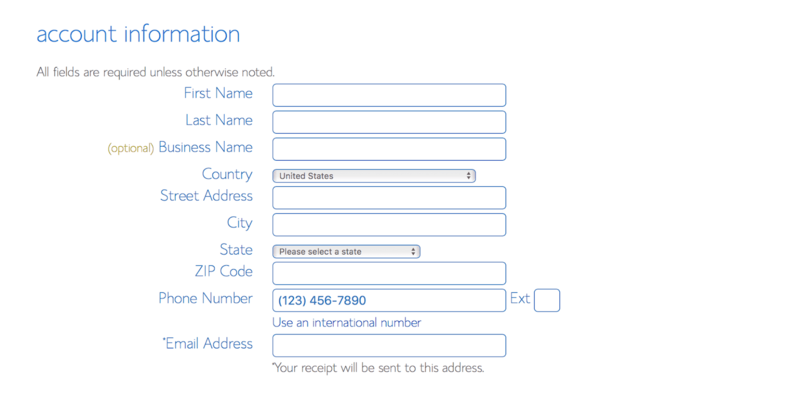 Confirm your package information on the next page and then complete your payment. Then create a strong password for your Bluehost account. You can install WordPress CMS (Content Management System) with Bluehost in minutes. 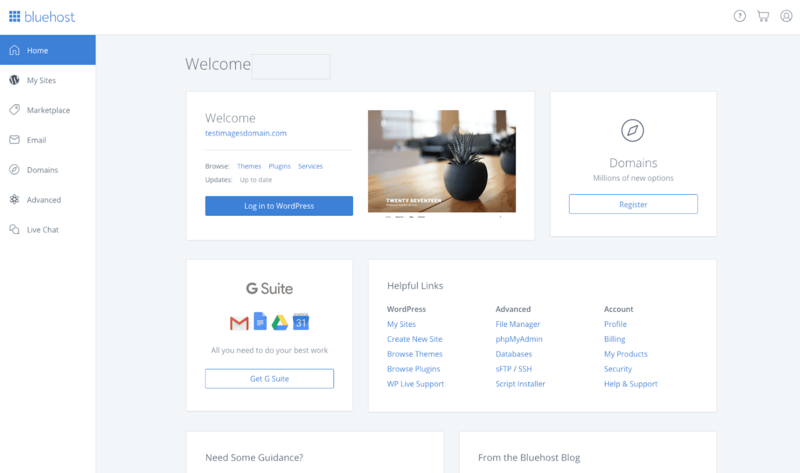 If you've followed the above guide by purchasing the hosting plan + connecting your domain, it will automatically install WordPress for you. You have to wait for 5-10 minutes or longer until the completion of installation. In case if you see the below screen for more than one hour, you need to login to Dashboard of Bluehost again. Click on Log in to WordPress. (It will automatically log in to your WordPress Dashboard). A home without paint looks dry and completely white. Likewise, to add colors you need to pick a fantastic theme for your blog. You can always pick a free theme right from the WordPress Dashboard. Install a free WordPress Theme. If you're not ok with the free themes, you can go ahead to Themeforest to buy a premium theme. Premium themes give you the professional look and buttery smooth user interface. It should be clean, and professional. It should attract your visitors. Prefer only fast loading theme. (It comes under the SEO part). It should have clear navigation to all important pages of your blog. This will help you to clear your queries regarding building a WordPress blog with Bluehost. Everyone should have a blog for digital identity. Are you ready to start a blog on WordPress? Create your own blog by following the above guide.